For a lot of people, going to see a family lawyer isn’t easy. It’s often the first concrete step they take towards a divorce or in a custody battle – and it can be fraught with emotion. Even when it seems that we’ve got our emotions “under control”, they have a sneaky way of showing up when we start talking to a lawyer and come face to face with the reality of what we’re doing. That’s where Bruno comes in. Bruno is a certified Therapy Dog. Probably everyone has experienced the quiet comfort the presence of a dog can bring. 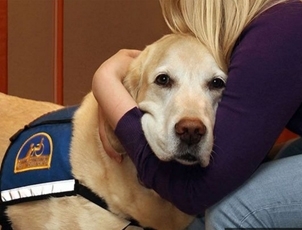 Therapy Dogs are specially trained to provide that comfort to people on an “as needed” basis. Dogs have, of course, been doing this for centuries. But in 2001, first responders discovered that dogs could significantly reduce the stress of working at Ground Zero. Since then, their use by physical and occupational therapists, psychologists and doctors has grown, as has the scientific research confirming dogs’ abilities to elicit positive physiological and psychological responses. We now know that simply petting an animal produces short-term decreases in blood pressure and heart rate. According to the American Heart Association, a 12-minute visit with man’s best friend “helped heart and lung function by lowering pressures, diminishing release of harmful hormones and decreasing anxiety”. Dogs can now be trained to perceive and react to cues given off by those experiencing anxiety, emotional distress or even an impending physical crisis. These cues can be overt, such as body language, facial expression or vocal qualities, or more subtle. Dog lovers would like to believe these abilities stem from the special relationship between humans and dogs, and they are at least partially right. Dogs’ evolutionary success depended in part on their ability to “read” their humans, but an equal contributor is dogs’ sense of smell. One thousand times more sensitive than a human’s, a dog’s nose can even smell the changes in blood chemistry that signal the onset of a diabetic crisis, a seizure or a migraine (changes that remain imperceptible to the human involved !). As the evidence of dogs’ ability to accurately perceive distress and, equally important, diminish it, has become more widely accepted, Service and Therapy Dogs are taking on more and more tasks. One of these is in the legal profession. From law offices to court houses, trained dogs are being welcomed into the legal system to provide support during stressful proceedings, such as helping an abused child testify or just decreasing visitors’ stress going through the court’s metal detector. Court house Dogs Foundation promotes Justice with Compassion via facility dogs that have graduated from an Assistance Dogs International member organization. These dogs work with a professional handler, typically a victim advocate, investigator or child advocacy center staff member. What do exactly Therapy Dogs do? While it depends on the situation and the dog’s specific training, a trained dog typically approaches a person and gently touches them with her (or his) nose. She might then slowly lift a paw to elicit a response from the person. People usually do respond, and then the Therapy Dog just continues to be a quiet presence for the person in need. We are thrilled that Bruno is now helping Walther Family Law clients (and lawyers!) to less stressfully navigate difficult conversations.